As for data export, there is indeed a limitation to free account. A free account can only export no more than 10,000 data rows once. If you'd like to export data exceeded 10,000 rows, you can update your account to any paid plan, or purchase one-time export credit for $5.9. 1. Can I export only the first 10,000 data rows if I extract more than 10,000 rows? No, you can only choose to export all of the data. 2. No matter how many data I extract with one task, the cost of export is always $5.9 once? Yes, and only when you'd like to export more than 10,000 lines, you need to use export credit ($5.9) or a paid plan. 3. Can I pay for the export monthly? Yes, we have a basic plan which allows unlimited export. 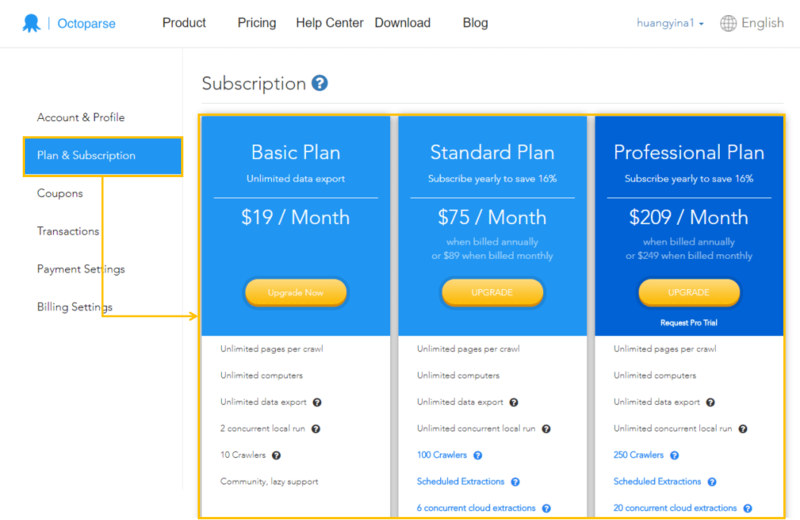 Just go to the "Plan & Subscription" Tab in your user center to upgrade to Basic plan.